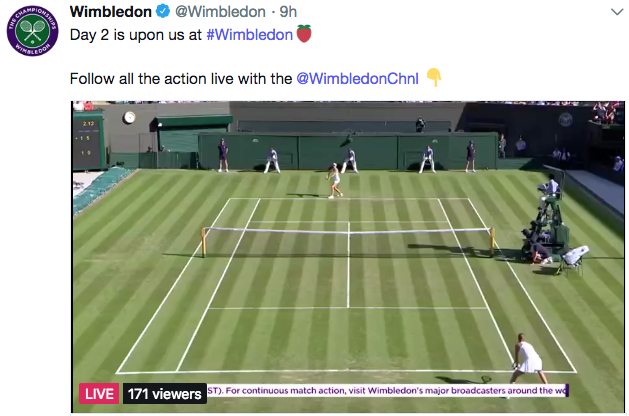 If you’re looking to watch some 2018 Wimbledon tennis coverage online, you can again do so on Twitter in Canada and beyond, thanks to the latter’s partnership with The Wimbledon Channel, for the third straight year. Twitter Canada explained in an email to iPhone in Canada coverage will include a variety of daily content, such as news, interviews, behind the scenes and selected action. The Wimbledon Channel is the digital news channel from AELTC, and The Championships 2018 will be supported by broadcast partners, to offer live around the Grounds at Wimbledon from 9AM BST (1AM PST/4AM EDT), leading up to close of play daily. Day 2 of the tournament is currently underway. Live stream coverage will be available in Canada and dozens of countries, for both logged-in and logged-out audiences, available @Wimbledon and Wimbledon.twitter.com. According to Twitter Canada, the “most mentioned” athlete data for January-June 2018, with Canadian pros Genie Bouchard and Denis Shapovalov at #12 and #20 most mentioned, respectively, while Milos Raonic was at #22. Also, when users use #Wimbledon on Twitter, they’ll see a strawberry emoji, representing the tournament’s traditional snack of strawberries and cream.